The A/P Aging report is the exact opposite of the A/R Aging report, which we covered in the previous lesson. The A/P Aging report provides a list of unpaid vendors that you owe. In order for this report to work, you must set up the payment terms your suppliers have extended to you in QuickBooks. In the setting up your vendors lesson, we walked through step by step how to set up payment terms. Why is the Accounts Payable Aging Report Important? Similar to the A/R Aging report, the A/P Aging report provides you with the payments that you have coming up. With this information, you can determine how much cash you will need to meet your obligations. It is important to pay the suppliers who extend you credit on time, so that you can maintain a good payment history. Doing so can also open the door for you to increase the current credit amount they have extended to you. Maintaining a positive payment history can also improve your business credit rating. What are the Components of the Accounts Payable Aging Report? Below you will find the A/P Aging Report for a fictitious company, Paul’s Plumbing. We will look at this accounts payable aging report example to help demonstrate the components of the A/P Aging report. Date: Similar to the Balance Sheet, the A/P report is as of a specific date. In this example, it is as of September 30, 2016. Aging categories: This report is organized by vendor and then by 5 different aging buckets similar to the A/R Aging report. The Current column indicates invoices that are not yet due. Beginning with the 1-30 day column, each category represents the number of days your invoices are past due. TIP: If you are having difficulty meeting your obligations in a timely manner, pick up the phone and call your supplier. Chances are, they will be happy to extend you some additional time to pay your bills. In addition, most of them will take a partial payment or set up some type of payment plan for you. The worst thing that you can do is not communicate with them. Totals by group: A good rule of thumb is to make sure that the majority of your outstanding payables stays within the first 3 columns. It should be a rare occasion that you have something creep into the 61 and over categories. If you do, be sure to address it as quickly as you can with your supplier. How Do I Run an Accounts Payable Aging Report in QuickBooks Online? From the Home page, click on Reports located on the left menu bar as indicated below. Click on the Recommended Reports tab. The A/P Aging Summary report is right below the Balance Sheet report as indicated below. From this screen, you have several options to choose from, as shown below. Show non-zero or active only – This will display only active vendors that you have an outstanding balance with. Days per aging period – Select the number of days you would like for each aging category. In Paul’s report, we have each category set to 30 days (i.e. 1-30, 31-60 days, etc.) Typically this is the most common option, but if you have terms shorter than that (i.e. Net 15 days), then you may want to go with 15 day increments (i.e. 1-15, 15-30 days, etc.). 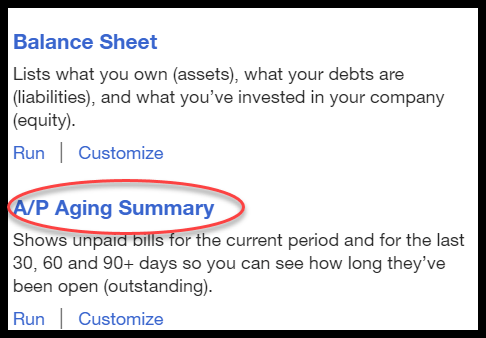 Number of Periods – Select the number of categories you want to age invoices. In Paul’s report we have a total of 4 (i.e. 1-30, 31-60, 61-90, 91 & Over). Click the Finish button, and your A/P Aging Summary Report will display on screen like the one below for Paul’s Plumbing. In order to view invoice details from the summary report, you simply click on the vendor that you want to see the details for. When you do so, QuickBooks will provide you with details of the invoice(s) that make up the outstanding balance for that vendor, as indicated below. By now you should have a better understanding of how the A/P Aging Summary report can help you stay on top of unpaid vendor invoices, so that you can be sure to pay your suppliers in a timely manner. That wraps up our lesson on How to Run an A/P Aging Report in QuickBooks Online.